Did your Hub make it to the first page of Google for your topic? If so, tell us what the Hub is about and how it made it there...oh, and great job! 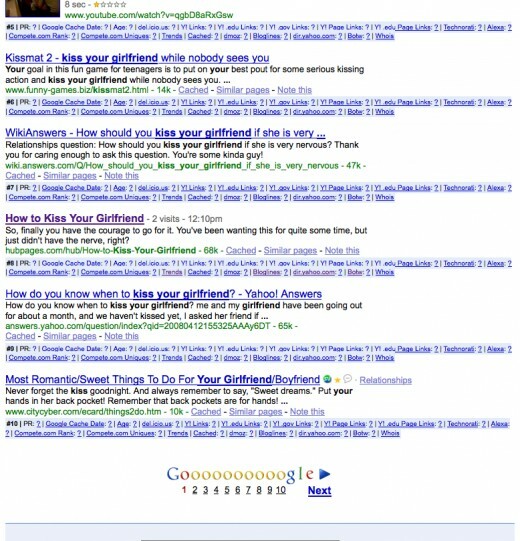 I saw that Ananta65's Hub How to Kiss Your Girlfriend is on the first page of Google results if you search for 'How to kiss your girlfriend' and 'kissing your girlfriend'. Great work everyone here, I guess together we prove that writing out of passion and for fun 'pays off' either in money or in recognition! Not only did it make it to the first page but the owner of the website I was talking about left a comment on my hubpage. Now thats a successful hub in my book. 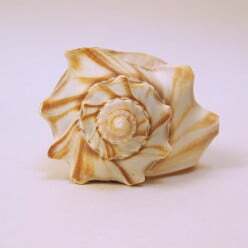 I also found a dupe of this hub someone stole from me http://hubpages.com/hub/Please_Rate_My_ … aked_Chest while I was looking thru Google. The site is even hotlinking the photo from the Hubpages server. 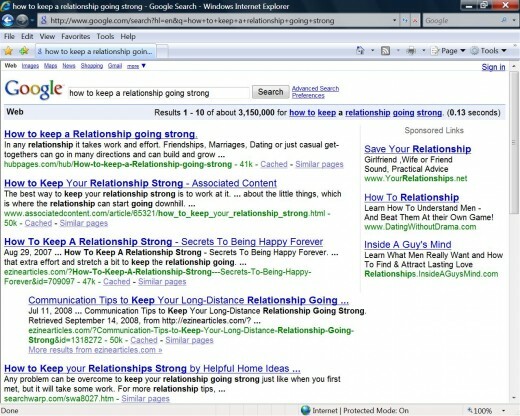 Niiiice...I know how hard it is to find the Google homepage while searching on Google. 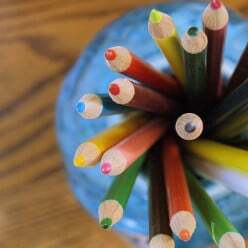 and also write "crafted" articles that follow certain SEO guidelines and it is done! Does it count if it's a link to a tag that only your hub occupies? I have a few other hubs on google and yahoo first pages but they can change from day to day. I come up on the first page for "navy boot camp", as well as a few other tags from that hub. Found several of mine, but consistently the ones that stay put are on obscure or odd topics, so not sure that does me a lot of good. Cajun traiteuse gets me there. I've got quite a few. I know that my wu-yi tea hub sits #1 on Google for wu-yi tea and its variants, my colon cleanse hub is the third result for colon cleanse scam, my pillow placement hub is #1 for both pillow position and pillow placement, several of my spa-at-home recipes are on the first page of some search terms like facial mask recipes, etc. Those are the ones I know for sure. Google "how to cook pumpkin seeds" and I'm on page one. Woohoo! I am on the first page for the "jelly belly belly flops" Hub that I wrote. Not a huge search topic, but it's a topic that a niche group is looking up quite a bit. Hey, hey...never bothered to even check until seeing this...but I've got one!!! Google Patriotic Movies and I'm on page one! Thrilling! Congrats! Your movie hubs are always fun to read. I have several but this one is the first on the first page..and has been for a long time. WHo would have thought people love donuts like that? So I ran through some of my own titles and tags, thinking "yeah, right" the whole time. 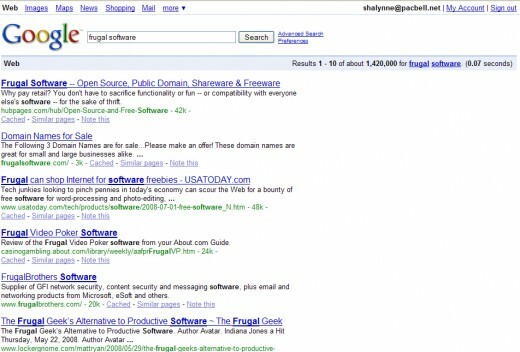 Then I Googled on frugal software (no quotes), and what to my wondering eyes should appear? 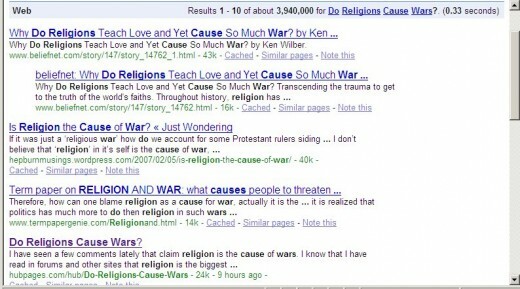 Wow, there's 1,420,000 results, too. 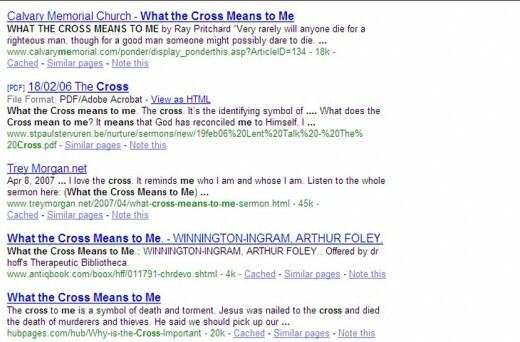 Actually I have an evil plan for it - but got to say its not the most heavily searched phrase on the internet ! The money making was supposed to be all these potential marketers signing up thru that hub with my referral code - but its been pretty unsuccessful on that! I have a bunch - but didn't have a chance to check everything. Playthings for Babies, Mommy Meltdown, How to Comfort a Grieving Child, Japanese Food Guide and Learn the Trapeze are also page one for their key words. My newest hub, Equestrian Riding Clothing is on page 1 already too! I'm so proud of that hub!! You know, GG, that hub is/ was brilliant. I wish I would have had somethng like that when I went to boot camp...It was in the 70s and I showed up at Ft Leonard Wood Missouri in a halter top and jeans. Did not own the proper..umm...garments. I'm number 9 out of 2,180,000 on Google for my article "How to Start a Personal Grocery Shopping Business." Pretty cool! Kudos to donuts and frugal-ness! How inspiring to find ourselves on page one of Google searches? this 'thread' of comments or forum-ing or whatever this is seems a great way to keep us hubbers connected and feeling positive! Congrats everyone! Oh...overlooked 'personal grocery shopping,' 'internet marketing,' and all of Amy Jane's successes...no slight intended...Congrats all around! 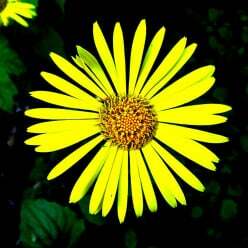 How can it be "the more unpopular the subject, the more likely you are to get the no 1 spot"? Put it this way - if you write a hub caled "David Beckham" what are your chances of fighting your way to the no 1 spot? But write one called "Maurice Tripalong-Fraggett" and the number one spot is your for the asking. I have a few. Google Paula Deen, fried green tomatoes and find "Paula Deen Don't Make Fried Green Tomatoes Good as Mama Did." That is my highest hit hub. Two others are "Rocky the Amazing Trick Mule," just google rocky, mule and it comes up on the 1st page, and my "Displaying Your Horse Show Ribbons" is on page 1 if I google, "display horse show ribbons. Of course it can all change, but this morning it worked. 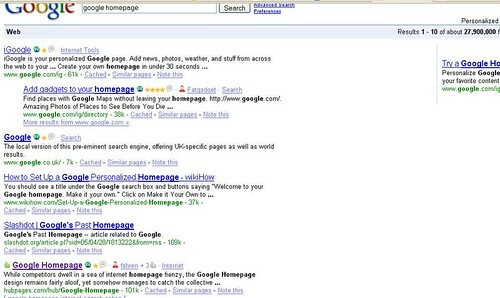 I never check my hubs on search engines but I have a few on google 1st page. Searching for Bicycles made out from wood - 3th place. Searching for Bicycles made from wood - 8th place. Searching for Italian mountain bikes - 2nd place. And my lens comes up at 4th . Searching for How to choose your children's bike - 2nd place. and 3th if searching for How to choose children bike. Searching for Madeleine McCann - The True of Lie - Book review - 1st Place. Madeleine McCann - The True of Lie - 2nd place. Searching for First Indoor Mountain Bike Park - 1st Place. But only 9th if searching for Indoor Mountain Bike Park. Searching for How to make a Super Car - 2nd place. Searching for Visiting Lisbon - 4th place. I´ll have to check out some of my other hubs . I tried again and it´s first place now . Wow! I checked 5 of my hubs out and this is the results I got: (I just copy and pasted these results... as I have no idea how to get the google pages to look loke google pages) This quite thrilling. I'm going back to google now to baste some more in my Glory. Hungary has the perfect growing conditions for plums. My families orchard in the northeast of Hungary had many old plum trees. Ok, I'll stop. Only the first two are going to get any searches anyway, and the version of my Arc Flash article sent in to an electrical magazine by a friend of mine actually appears on the second page or Arc Flash Analysis search before the actual hub lol. /sigh. I never even thought to check to see if any of my hubs made it to the top page. I went and did it for a couple and one of the couple that I did check was number 3 on the first page! I was surprised, cause it was the Hub on teaching your baby to speak, and I figured there would be a lot of information out on the web for that topic already! I will have to check for the others. I have no idea. Haven't had time to check all of them or to check on Yahoo but at least this gives me a temporary boost in confidence lol. Thanks for starting this topic. It will remind me to check more when I have time! Woohoo! I just Googled "how to raise a baby sparrow", and my hub was the second result on page one! Wow, I had no idea that there were so many Hubs that ranked so well! Keep them coming if you have anything else to add as time goes on, I'm sure that we'll just have more and more hitting that sweet-tasting front page. "Hubbers who Have knocked My Hub Off The 1st Page Of Google"..!! Keeping this topic alive, baby! 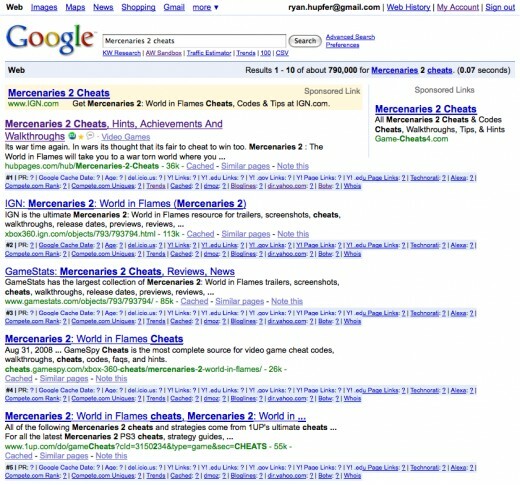 Check out SunSeven's Hub on Mecenaries 2 Cheats that is #1 on Google...niiiice. My travel hub on Italy: http://hubpages.com/hub/Scalea--Italy made it to first page under "Scalea". The hub on swimwear http://hubpages.com/hub/Swimwear-for-curvy-girls, the Curvy or fat? http://hubpages.com/hub/Curvy--or--fat- and the one on French men: http://hubpages.com/hub/Why-are-French- … resistible also made it to first page matching for exact titles. I haven't check any others yet... I'll have a look. I just checked my latest hub which was published last night and it is/was number 4 on page 1 of Google search. Also my Sarah Palin's Acoomplishments hub ranked number 1 on Google page 1. Thank you Princessa. You wouldn't happen to be a model would you? Oh man, I have lost track of this thread....great work everyone - this is so awesome! 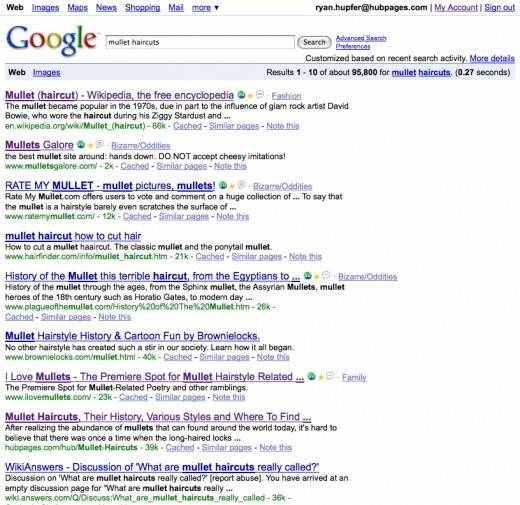 I just saw that my first entry about Mullets that I submitted into the HubMob Weekly last week is now on the first page of Google when searching for 'mullet haircuts'. Boo yah!! Show us more if you've got 'em! I just searched for another of my hubs and found out it is in position number 6 on Page 1 of Google. Results 1 - 10 of about 30,400,000 for The Missing Part. I was only kidding Princessa. I read another thread about the model. Maybe I should send you some fanmail. I wonder what I should say in it? To my surprise I have several on the first page of google over 30 that I had time to check, too many for a screen shot. Ryan this was a good test, I was pleasantly surprised. Thanks! My hub Redheads: Myths, Legends, and Famous Red Hair is doing very well. Entering any combination of those words, Red hair myths and legends, for example, returns it in the #1 position most of the time. Some combinations return it in the top 5, but usually it's #1. Can't get the screen shot to work. Likewise my new hub, Save Lives and Make Money with Home Grown Penicillin comes back at #1 (but it's an odd title) however, just Save lives with Penicillin comes back at #2 and Homegrown Penicillin is #3. To my surprise the hub I wrote about How to Keep a Relationship Going Strong is Number 1 out of 3,150,000. 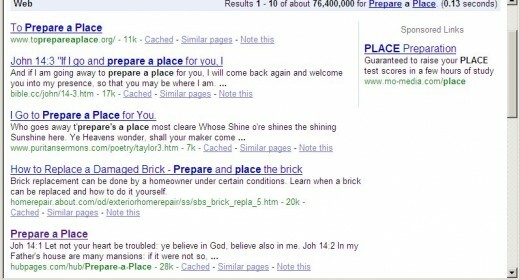 My hub Prepare a Place is listed in position 5 on the first page of Google. This is all so exciting and making everyone upbeat! I am proud to say that my VERY FIRST hub that I wrote is #1 page one for that title plus its first page top 10 listing for about 10 other similar and not so similar searches. Some of those searches were top google searches at one time, so I pretty happy. Woooo Hoo!!!!! I'm on the first page of Google!! How did THAT HAPPEN?! Being a fairly new hubber and just getting adsense approval and looking forward to earning I re-visited the success story page and noticed that it is very outdated. All of the "stories" show as of October 2011...I am wondering why. Any thoughts? Urgent SEO help required. (Google certainly aren't looking at quality!